Today we celebrated Ty's birthday with 12 of his friends. At our house. It was chaos! But so fun! 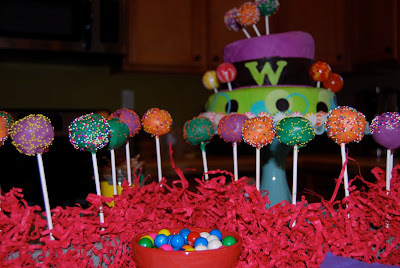 And the Willy Wonka theme was a blast to plan around. We had more ideas than we had time or resources. 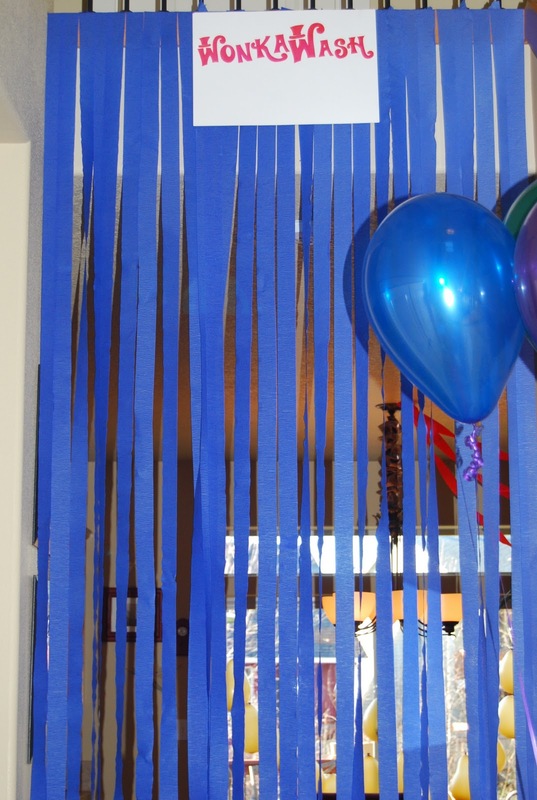 You could really run wild with this party theme. 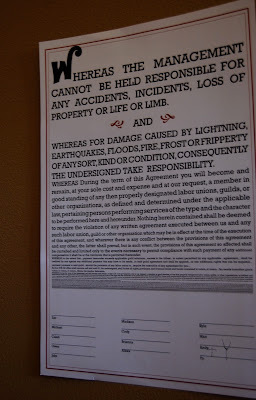 We kept it fairly simple, since it was for a group of 4 and 5 year olds, many of whom hadn't seen the movie. It all started with the candy bar invitations, complete with golden tickets. I am realizing as I post this that I'm missing tons of photos. We just got busy with the party and forgot to get pics of so many elements. But this is the Wonka Wash (hsaw aknow, for those who know the movie... we just thought that might be confusing). The guests walked through as they entered the party. 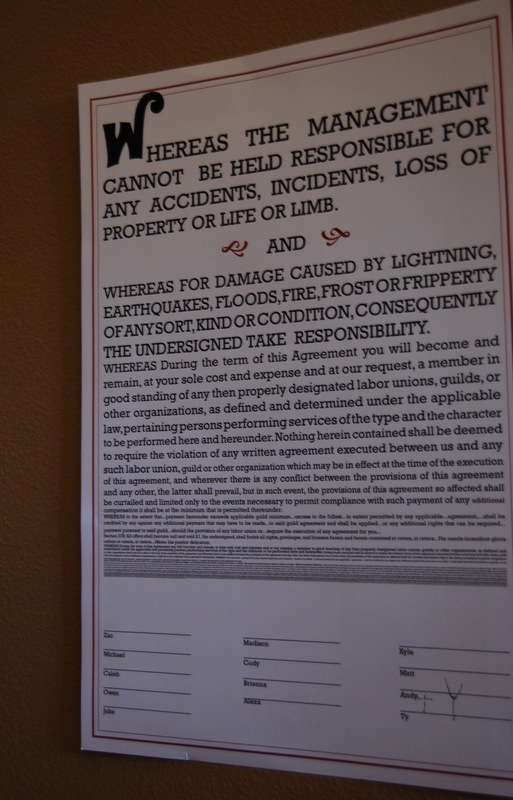 And the contract signed by the kids in the movie as they entered the chocolate factory. Mike customized ours with each guest's name. He used the wording from the movie, but needed to fill more space.... so at the very bottom in the tiny, unreadable print is the Declaration of Independence, along with some lyrics from 'Baby got Back', by Sir Mixalot. A little throwback to our jr high years, apparently. Here's one angle of the dessert table. 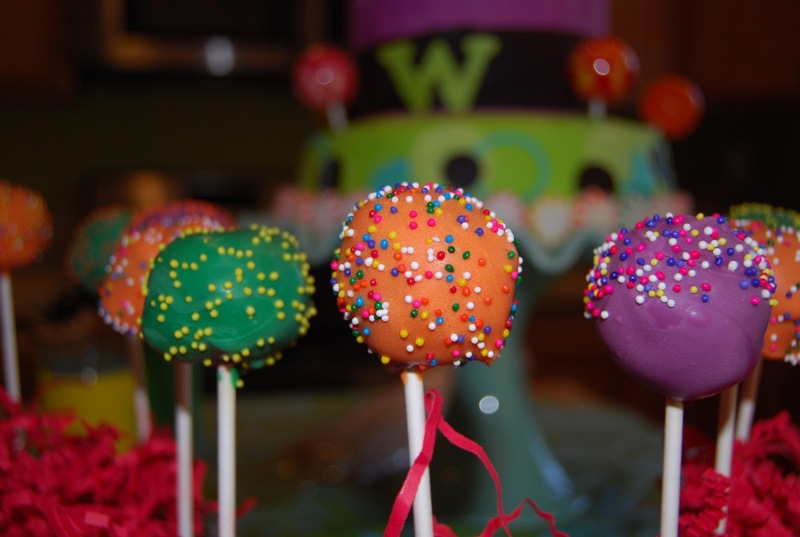 A cake pop (of course) "river", with my attempt at a fondant cake in the background. I used my new Cricut Cake to cut the 'W' and all the little circles on the cake. 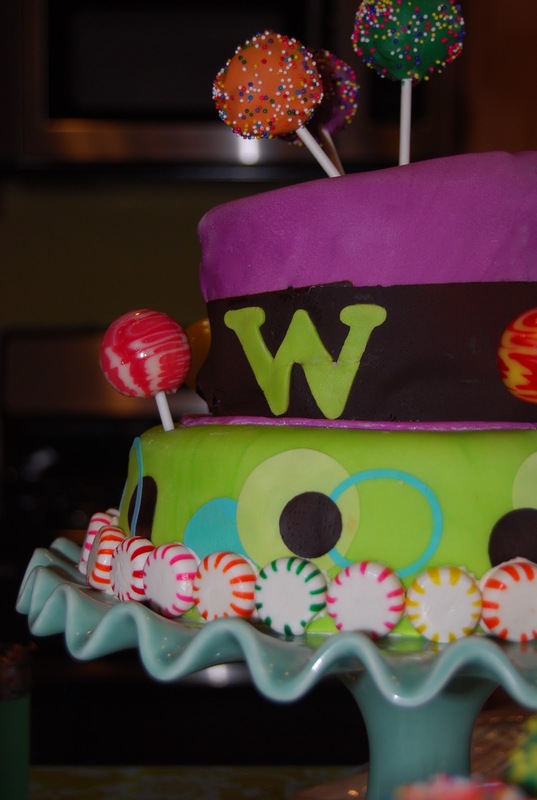 The top is supposed to be Willy Wonka's hat. Hmph. Good thing I signed up for my first cake decorating class next month! Super excited about that. 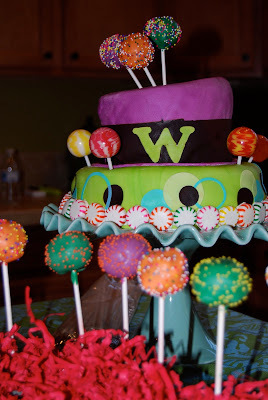 I really did have a ton of fun decorating this cake. Fondant is tricky! But super fun! I can't wait to play more. I'm sad that I don't have pics of the rest of the dessert table. We borrowed a chocolate fountain from a friend and I made bouquets of treats to dip. Doughnut holes, strawberries, marshmallows, then plates of mini oreos and nutter butters (mmmm), bananas and pretzels. It was yummy and super festive! Very wonka. Yep. Here's my dorky painting of an oompa loompa. And oh, that blasted song! 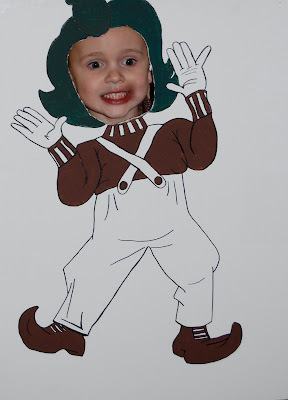 I can't even think the words 'oompa loompa' without it getting stuck in my head. Please excuse the chocolate all over my son's face. 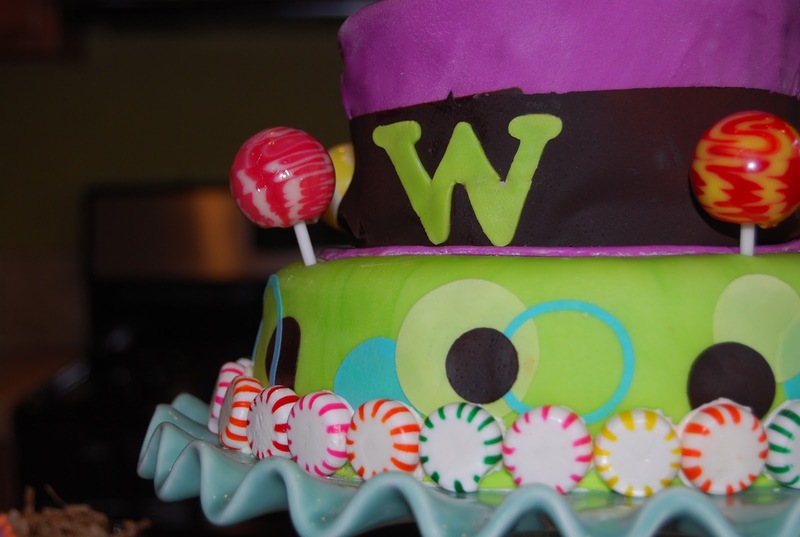 It was a wonka party after all. 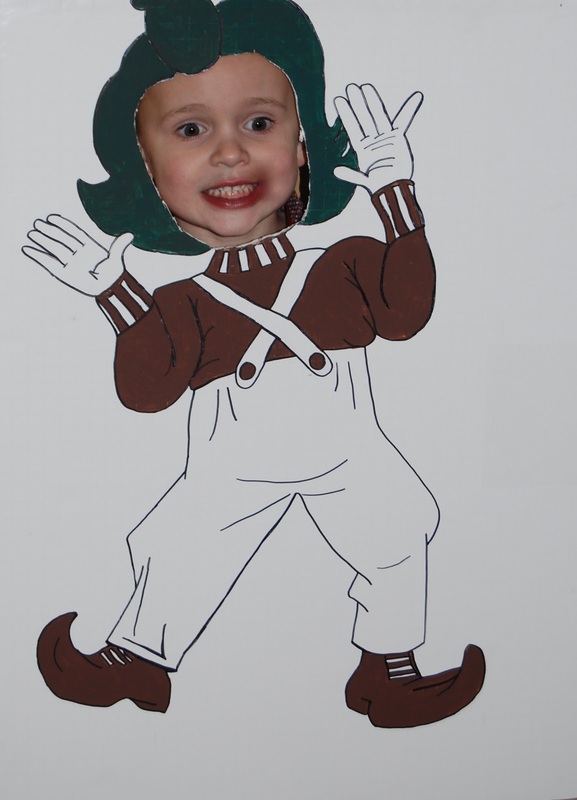 I managed to snap photos of most of the kids as oompas, which I plan to print and send along with the thank-you notes. They were hysterical. I can't believe that's all the photos! We played the ole "pop a ballon to get the prize inside" game... but used gold balloons in the shape of a 'W'. Also did a 'golden egg hunt', but each egg was labeled with each child's name to be sure everyone got one. I got 12 boxes of Everlasting Gobstoppers and wrote each guest's name on one, then placed them all in a bowl near the gift table. At gift time, Ty pulled a box from the bowl, read the name, and traded the gobstoppers for the gift from that particular child. This cut down a bit on the frantic "open mine next!! ", which gets confusing and frustrating for the birthday kid. Oh, and my husband printed coloring pages with scenes from the movie and we set up a coloring station in Ty's playroom for something to do as guests arrived. Check back in the next day or two... I've finally taken some pics of Ty's room makeover that we did for his birthday surprise and I'll be posting! I'm so impressed. You guys really nailed the greatest details. Such a fun party--even for adults!